I’ve been buying bison for years. In fact, whenever I see it at my local grocery, I usually buy as much as I can afford because of how delicious it is. Bison is the leaner and sweeter cousin to traditional beef, which makes it not only a healthier choice but also a more flavorful one. I've been craving the flavors of the Southwest, despite the fact I've never actually been on mountain time. Whenever I think of the West, I imagine cowboys out on the range and big herds of bison roaming free. If you are looking for the best bison to buy, I pretty much exclusively buy Lone Peak Bison or Great Range brand bison – they’ve been in the bison business for over thirty years, so it’s safe to say they know what they are doing when it comes to the first official mammal of the USA. Because bison has much less fat than ground beef, it cooks much faster. Many people treat bison as the same type of meat as beef, when in actuality, the two are very different. Traditional beef has little flavor, which is why many recipes call to smother it in lots of herbs and spices. With bison, very little is needed to make it delicious. I seasoned mine with a dash of paprika, cumin, and red pepper flakes to compliment the natural sweetness of the meat with some spiciness – without going overboard. 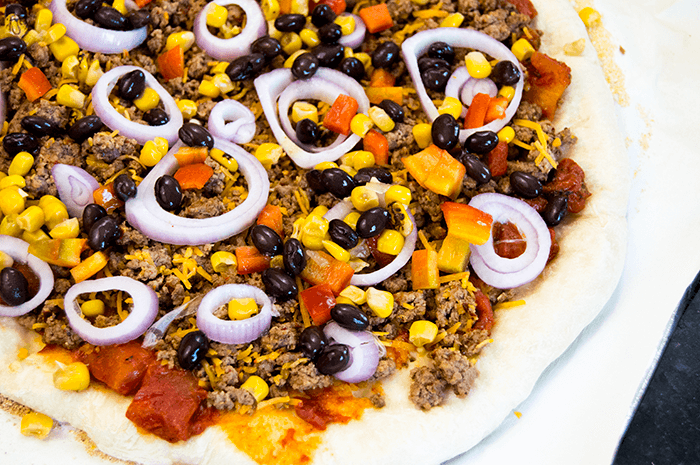 I made my pizza in true Southwest style: with fire roasted tomatoes and corn, black beans and red peppers. If you’re feeling adventurous, use a spicy Mexican cheese instead of mozzarella - I used a shredded chipotle cheddar, but only used about a fourth of what I’d normally use on my typical pizza. It’s all about the bison in this recipe, so whichever type of cheese you go with, just remember to use it sparingly. 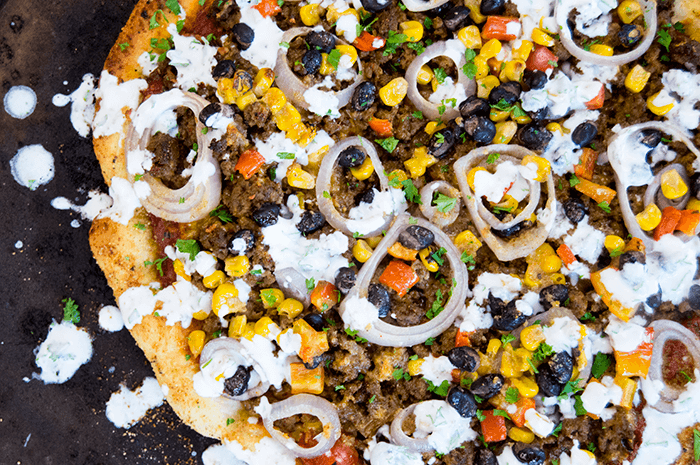 The cilantro lime sour cream that is drizzled across this pizza adds an incredible tang that pairs very well with the sweet flavor of bison and the spiciness of the cheese. If this sour cream looks familiar, it's because I've made it before - and not surprisingly it's delicious on everything. Once the pizza is out of the oven, let it rest for a few minutes before cutting into it, for optimal flavor (and ease of transport to your mouth!). As it cools, drizzle on the sour cream and sprinkle on any remaining cilantro. Once you've tried it, you'll certainly be singing "Oh give me a home, where the buffalo roam, Where the deer and the antelope play! Where seldom is heard, a discouraging word, And the skies are not cloudy all day." What are your favorite bison recipes? What uncommon meat should I try next? Let me know in the comments below! Preheat the oven to 425°F. Preheat your pizza stone for one hour, if using. If not using a pizza stone, place a large cookie sheet in the center of the oven while it preheats. In a skillet over medium high heat, add the ground bison and cook and crumble for 5-10 minutes or until the bison has few pink spots left. Add the paprika, cumin, and red pepper flakes. Stir well to combine, then remove from the heat. In a small bowl, stir together the cooked bison with the chipotle cheddar cheese. Season with salt and pepper to taste, then chill until ready to use. Dust a clean surface with flour and roll out the pizza dough so it is 1/4-1/8 inch thick. Spread out some parchment paper on a wooden cutting board, large enough for the dough to fit on, and dust with corn meal. Place the flattened dough on the parchment paper. Melt the butter and stir in the garlic powder. Brush the dough with garlic butter, then transfer the dough on the paper to a preheated pizza stone. Prebake for five minutes. When the pizza has puffed up but has not yet started to brown, remove it from the oven. Spread on the fire roasted tomatoes as the base, leaving about a one inch crust, then add the bison and cheese, and top with corn, black beans, red peppers, and sliced shallot. Brush any remaining garlic butter onto the exposed crust. Return the pizza to the preheated pizza stone or baking sheet. 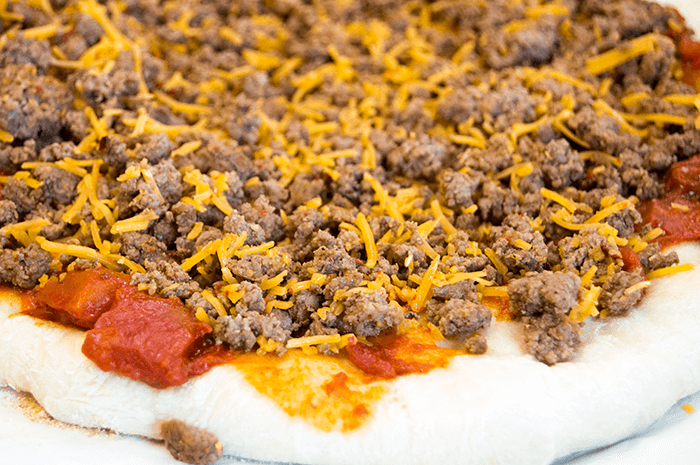 Carefully slide the pizza off the parchment paper onto the stone or baking sheet (this ensures a crispy bottom). Bake for an additional 7-10 minutes, or until the crust is golden brown and the cheese has melted. While the pizza is baking, whisk together the sour cream, cilantro, and lime juice. Chill until ready to serve. Remove the cooked pizza from the oven. Let it rest 5-10 minutes prior to cutting. 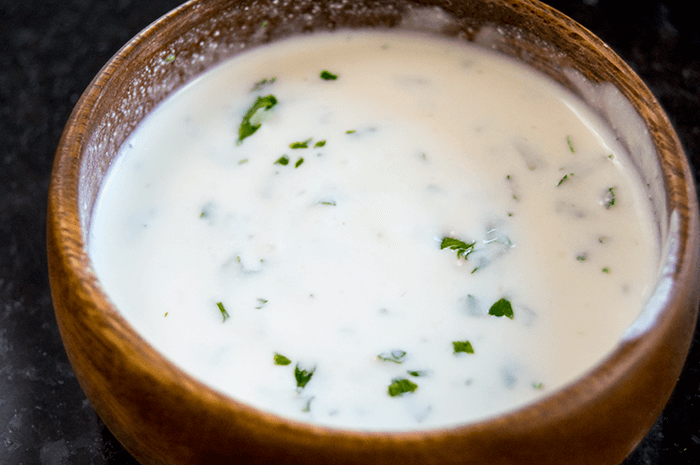 Drizzle on the cilantro lime sour cream. Serve warm and enjoy! A special thanks to Lone Peak Bison for sponsoring this delicious recipe. 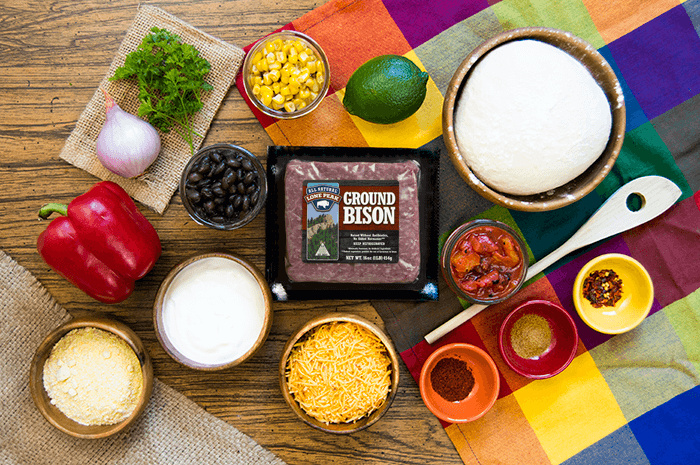 Visit LonePeakBison.com for more information about cooking with bison and where you can find their products in a store near you. 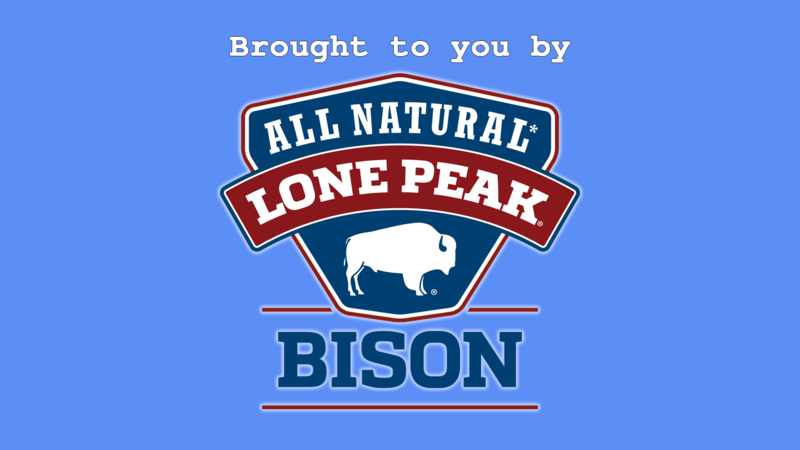 Like Lone Peak Bison on Facebook!